Are you providing care and assistance for an older person? Are you an older person caring for a child with a disability? Are you responsible for the care of an individual diagnosed with any form of dementia? Are you 55+ years old and raising a grandchild age 18 or younger? The Family Caregiver Support Program has been developed to provide supportive services to caregivers, ages 60 and older, and to help relieve some of the ongoing stresses associated with caregiving. Every situation is as unique as the individuals involved. The staff at Shelby Senior Services looks forward to assisting you with both your needs as a caregiver and your family’s needs. How might The Family Caregiver Support Program assist you? Initial Assessment of the caregiver’s needs can be completed in the home. The assessment provides an opportunity to identify available resources. The social worker will assist with making the appropriate referrals. The Caregiver Support Plan will be developed with the input from family and friends to aid in planning ahead for temporary help in a crisis or long-term help in the event that the primary caregiver is not able to continue. Planning assistance for temporary placement in an assisted living or skilled care nursing facility if the need ever arises. Support through a listening ear or a shoulder to lean on. In-home companion care based on need and income qualifications. Support Groups and Classes are available to assist with a variety of needs. These may include practical skills for caregivers, Helping Hands classes for spouses to learn tasks once performed by the care recipient, and informational groups dealing with certain diseases/illnesses. Members may share their frustrations, learn from each other, and support one another through groups including Alzheimer’s Association, Caregivers of Shelby County, and Parkinson’s. Services, Inc., supplemented by Shelby County United Fund for You allowing the agency to provide supportive services to caregivers, age 60 and older, to relieve some of the ongoing stress associated with caregiving. Donations are gratefully accepted to supplement the Older Americans Act, Title III-E funding, which allows continuation of these services. Contact Shelby Senior Services, Inc. to ask about these services. (317) 398-0127 or on the web at www.shelbyseniorservices.org. Do you have an hour a day, week or month that you would like to spend making a difference in the lives of older adults? Come and spend an hour with us as we describe the variety of volunteer opportunities available!!! We have been happy to share donations to us of unopened incontinent supplies with those in need. However, we are only able to give out what is donated to our agency. Contact Ralanda Smallfelt, Family Caregiver Program Coordinator, (317) 398-0127. Your identity will remain confidential. Confused, frustrated, yet determined to give the very best care to a loved one is a blended lifestyle shared by so, so many, and, shame is to be no part of it. 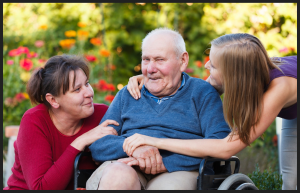 Caregiving to either an elderly family member or a loved one who is challenged by disabilities, brings a host of new responsibilities that may be unfamiliar or even intimidating. It is not a weakness for the caregiver to become overwhelmed or feel alone, but it is a sign to seek a support system and resources to make the caregiving process more manageable. That support and collection of resources are here in your own county, too, right inside the doors of Shelby Senior Services. In addition to daily availability through the agency’s Family Caregiver Program Coordinator, Ralanda Smallfelt, Senior Services brings another perspective to you once a month from the Indianapolis office of CICOA, Aging & In-Home Solutions. CICOA Options Counselor Tara DeBoo will be at Senior Services once day a month, offering confidential, one-on-one discussion time to organize thoughts or to have questions answered about available services supported by CICOA, Aging & In-Home Solutions, to learn about options you didn’t know existed or to explore Medicare services. Appointments may be scheduled by calling 317-398-0127.